Are you superstitious? [No. It’s bad luck to be superstitious. - Ed.] I ask because a lot of people believe that bad luck always comes in threes. As you are all aware, thegrambler.com has been delayed in recent weeks thanks to my internet connection giving up the ghost. That is all settled now. Touch wood. Then, I told you all about my gas boiler woes. That has also been resolved. In its case I had to hand over a wad of dosh. Anyway, fingers crossed. Surely nothing else can go wrong. Or can it? Yes it can. Our dishwasher broke down. But you hate dishwashers, I hear you exclaim. Indeed I do, I find that they are as time consuming as hand-washing the dishes. However, when it isn’t operational, I have to grudgingly admit that I actually miss the blibbing thing. So, it had to be repaired. More money. We scoured the local newspaper and Yellow Pages for somebody to come and fix it. However, many of these smaller businesses stipulate a ‘call-out’ charge. Sixty quids some of them want. Now, I could understand them asking for that when they are dealing with an emergency at two in the morning, but these guys are demanding it for every job. Excuse me? That means they could visit two or three call-outs every day, say they can’t do the job and trouser 60 quid each time. Ker-ching is a sound that comes to mind. Not bad eh? Getting paid to do f***all. Mind you, social media being what it is, the lazy bast... person’s name would be plastered all over it pretty quickly. An engineer arrived as arranged. He spent a wee while assertaining what was wrong and said he would have to order parts. Fair enough. A week or so had passed when the same engineer came back with the needed parts - a control board and a pump. When he had fitted these, he realised that something else was wrong and he would have to order more parts. I was beginning to feel thankful that we hadn’t got a local electrician in to try and sort the problem; it would have been frighteningly expensive. So, the new part was ordered and, a week or so later, a different engineer came to fit it. Although it isn’t relevant, I believe this guy was probably the grumpiest artisan I have ever had dealings with. He moaned about the machine. He moaned about his workmate. He moaned about whoever had put the machine in place. Any road up, he fixed the machine and went on his grumpy way. Is that the end of the story, I hear you ask. Unfortunately, no. That evening we used the newly repaired dishwasher for the first time. All seemed to be going well, but we soon realised that something was amiss. Why were our feet wet? We quickly switched the unit off and phoned Know-h... oops, nearly said it. We phoned Kormas’ repair company, while inwardly cursing Mr Grumpy for his incompetence. A third engineer came the very next day. It should have been a simple case of ascertaining the source of the water leak and tightening something up. This, he did. He then checked that the machine was now fixed by testing its operation. Nothing happened. The machine just wouldn’t start. He then spent the best part of the morning trying to find what had gone wrong before concluding that the machine couldn’t be fixed. I didn’t scream. I nearly did. But I held it back. We had spent several weeks without a dishwasher and the outcome was that we still didn’t have one. That very day, we headed for our nearest Kormas and purchased a new dishwasher. It would be fitted the following Friday by somebody from the repair company which we had now dubbed ‘no how’. Friday came and the delivery men arrived as arranged. Woo hoo! A dishwasher at last. Nope. The upshot was that another date for delivery was arranged. In the meantime I had to go my local B & Q (Kormas don’t sell this very necessary kit. How daft is that?) and buy the required kit of parts. Finally, the machine was installed and up and running the following week. It had taken five weeks and six visits from No way personnel to get to that point. You’ll be pleased to know that the machine does work. Rather well, in fact. I don’t want to give the manufacturer free advertising but this clip might give you a clue to the brand. Incidentally, the company that tried and failed to fix the old machine sent a request for feedback. I suggested that they change their name to No way or No chance. It didn’t go down too well. PS - The kettle packed in today. Bang goes the trouble comes in threes theory. Were any famous or notorious people born on the 29th of July? Of course. Here are some I’ve even heard of. Benito Mussolini 1883 (He’s a bigga da flop. ), Theda Bara 1885 (Early film star. Her name was a deliberate anagram of arab death. ), Sigmund Romberg 1887 (Composer. Wrote this. All together now... My desert is waiting. ), William Powell 1892 (Ectaw. The thin man. ), Clara Bow 1905 (Ectress. The ‘it’ girl. ), Richard Egan 1921 (Elvis Presley’s big brother. [Really? - Ed.] No, not really. But in the film Love Me Tender, he was. ), Robert Horton 1924 (Ectaw. Flint McCullough in Wagon Train. ), Robert Fuller 1933 (Ectaw. Cooper Smith in Wagon Train. A character that replaced... Flint McCullough. ), David Warner 1941 (Ectaw. Morgan Delt. ), Stig Blomqvist (Svedish relly blöke. ), Diane Keen 1946 (Ectress. Factoid: Was secretary of the Ivy League fan club. Remember them? Pop group from sometime in the last century. Since musical links are a bit thin on the ground this week, that gives me a rather tenuous excuse for a clip. All together now... There she goes with her nose in the air... Sorry about the bloke that introduces it; he obviously hasn’t been totally erased from our collective memory. ), Joe Johnson 1952 (Snookery bloke. ), Ken Burns 1953 (Film maker. ), Nellie Kim 1957 (Gymnasticky bloke. ), Simon Nye 1958 (Men Behaving Badly creator. ), Graham Poll 1963 (Footy ref bloke. ), Sally Gunnell 1966 (Runny jumpy bloke. ), Andi Peters 1970 (Edd the duck’s pal.) and Fernando Alonso 1981 (Racey car bloke.). 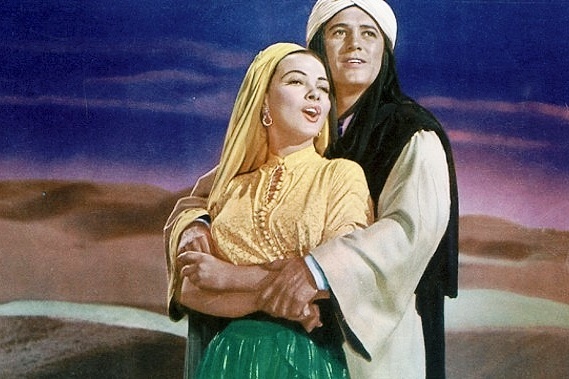 I thoroughly enjoyed the clip from Sigmund Romberg’s operetta, The Desert Song. Nice to have a bit of class in amongst the usual rubbish. Here’s a question for you. You could use it as your teaser, instead of that football nonsense. What was Romberg’s first successful operetta? Reasonably whopping I think you will agree. Teaser time. Yay! Last week’s question was about Kieron Dyer. I asked you what Dyer did on two of his 33 England appearances that made his international career unusual. The answer was that he only played for the full game on two occasions; the other times he was either brought on as a sub or substituted himself. A secondary question asked you how many goals he scored for England. The answer was precisely zero. Doesn’t sound like the most illustrious international career. One for this week? Let’s have a World Cup question. Who was voted the player of the tournament at the 2014 World Cup finals, but seemed embarrassed at the award? And finally, Cyril? And finally Esther, I am indebted to a Mr S. Nye for a clip to end this week’s edition of thegrambler.com. He is an accomplished writer is Mr Nye. Not only has he written several sitcoms, he gave us The Durrells and several pantos for ITV [Oh no he didn’t! Hur hur! Panto. Oh no he didn’t. Geddit? - Ed.] Ahem, he is also known for his translations of dramatic work such as Moliere’s Don Juan. However, his best-known (and much-loved) creation was, undoubtedly, Men Behaving Badly which ran to six series (42 episodes). Let us finish with a wee clip from that. Enjoy a rather silly moment from that show.